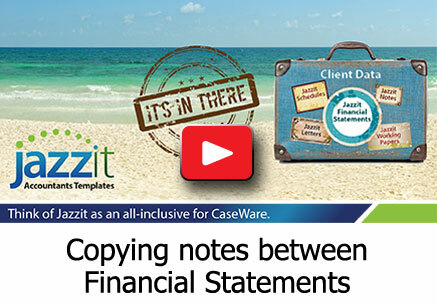 Notes and policies in the Jazzit financial statements (FS) now have the ability to be replaced with a corresponding note/policy from another FS in just a few clicks. This option can be found by right-clicking on the delete button of the note/policy. If you do not see this option, ensure that a note/policy with the option is inserted into the FS. Afterwards, the other notes/policies in the same FS should have this option. In order to replace a note/policy it must have a matching note or policy ID. 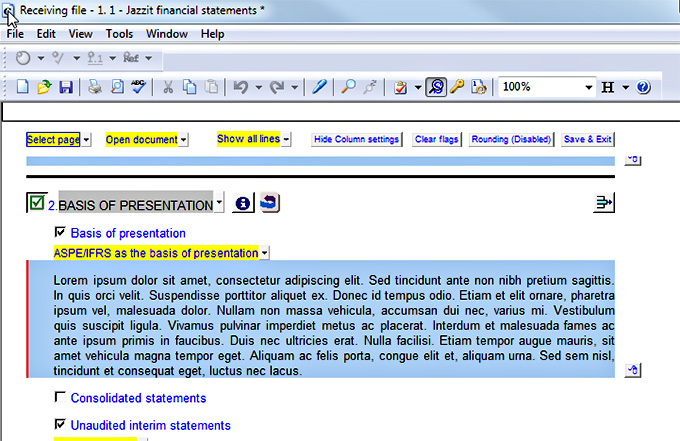 In this example, we are replacing the “Basis of Presentation – default” note. We can only replace it with another “Basis of Presentation –default” note from another FS (the source FS). Be sure that the Note ID from the source FS and the Note ID of the note you are replacing match exactly. This applies to notes in the same category. 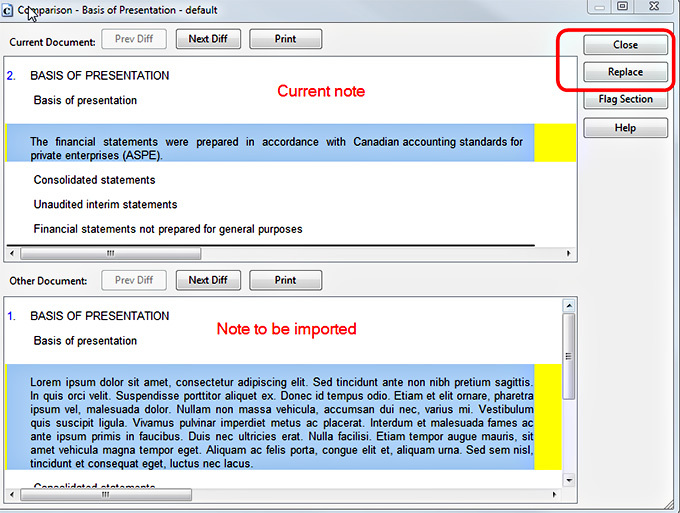 For example, a note with “Basis of Presentation – default” as its ID cannot be replaced with a note that has “Basis of Presentation – option 1” as its ID. The picture to the right shows the note as displayed in the source FS. Note that the text in the note has been edited and that its ID is the same as the note above (i.e. Basis of Presentation – default). In the receiving FS, click on “Get this note from another file”. We will be presented with an open dialog window, from here we want to locate the source FS document we will be obtaining the note from. 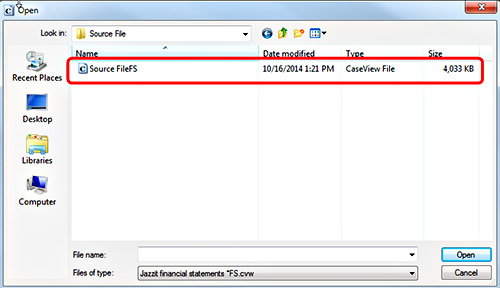 The source FS document should be located in the same folder as the source CaseWare file and its name should end with “...FS”. If you do not see the FS document, make sure its identifier is FS. (see link for instructions in the Jazzit Community). After selecting the source FS, we will be presented with a comparison window where we can compare and review the note we are about to import. Click on “Replace” to confirm note replacement, click “Close” to cancel note replacement. After clicking “Replace”, click ‘No’ to keeping input cell data. This will replace the note with the note from the source FS. The Basis of Presentation note as replaced by the source file.